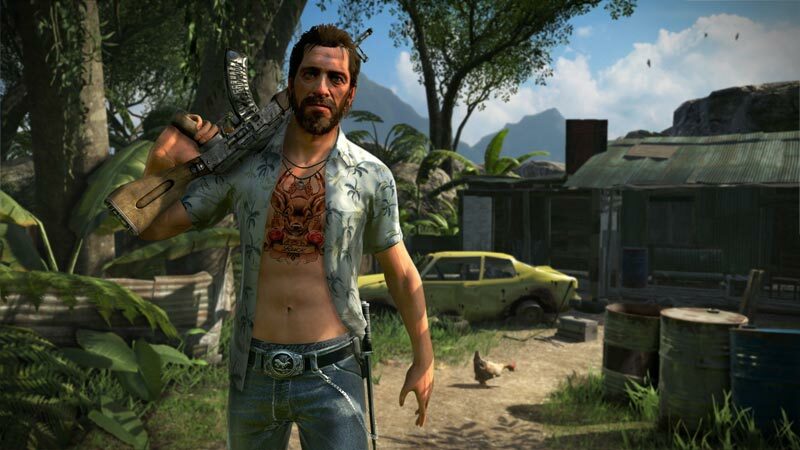 In Far Cry 3, players step into the shoes of Jason Brody, stranded on this mysterious tropical island. You dictate how the story unfolds, from the battles you choose to fight down to the allies or enemies you make along the way. Slash, sneak, detonate and shoot your way across the island in a world that has lost all sense of right and wrong. Beware the beauty and mystery of this unexplored paradise and live to outwit its roster of ruthless, desperate characters. You'll need more than luck to survive. If you can look past its thematic problems, Far Cry 3's story isn't without genuine invention and surprise there's a hallucinatory aspect that allows for surprising, disorienting sections of narrative and character development, as well as gameplay moments that defy the basic reality of the rest of the game. When the story isn't standing in its way, Far Cry 3 sees enormous success with its wide-open world and all the numerous things there are to do therein. Ubisoft has created a mechanically ambitious, exciting game. The multi-dimensional and unpredictable nature of this jungle journey makes each and every mission a crap shoot, and is ultimately what makes Far Cry 3 enjoyable. It’s one of the better shooters of 2012 if just for its variety in its gameplay and sandbox elements. Eventhough it doesn’t stick to the hyper-realistic nightmare that it kicks off with, it’s still a rewarding story, though we would have liked to see this original idea seen all the way through. 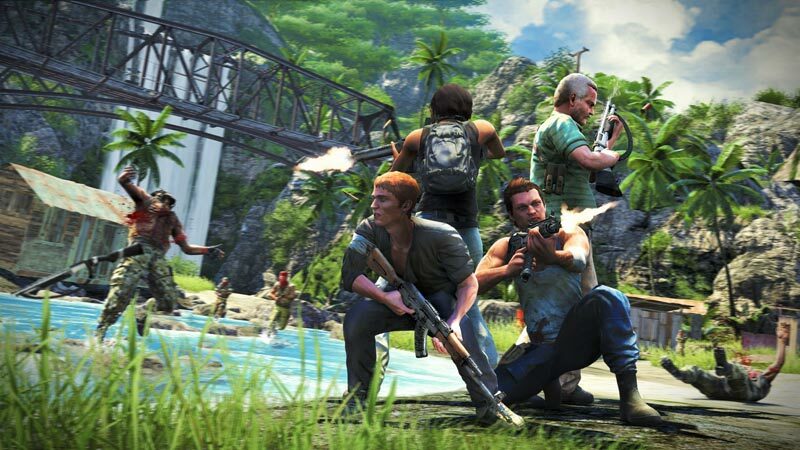 Far Cry 3's single player story may have its ups and downs, but it's still an incredibly in-depth action experience. Its combat and open-ended gameplay is engaging and well-designed, and there are plenty of incentives to explore the game world to see what you can find. The multiplayer modes, while not as detailed, are a nice extra feature that's just as enjoyable as the single player campaign. 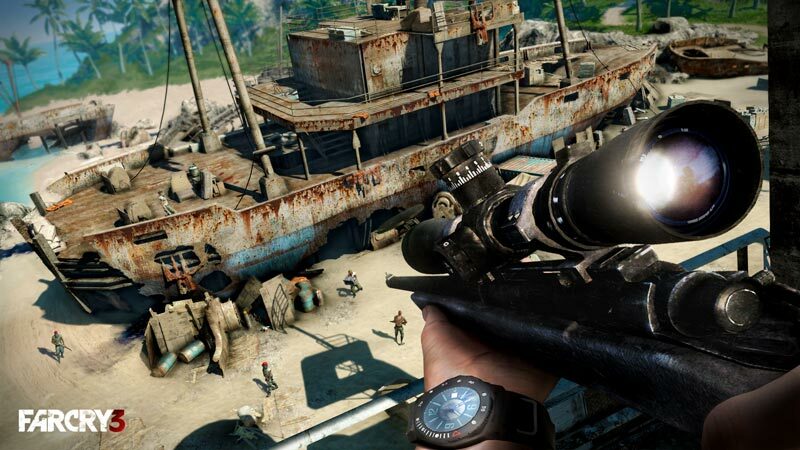 The good times are even further extended by Far Cry 3's impressive multiplayer map editor, which makes it relatively simple to bring your ideas to fruition. You could lose many hours to this one feature, let alone the game's other facets, all of which make this one of the most robust shooters on the market. Yet Far Cry 3's bigness isn't a detriment: you rarely feel that the game's size led to individual elements suffering from a lack of attention or detailing. After two remarkable but uneven offerings, Far Cry finally pulls everything together in the third installment. The diverse open-world action, compelling story, and an alluring environment that begs exploration are all high water marks for the series. This is an island adventure all shooter fans should experience. Ubisoft kept the Far Cry name, and Crytek tried to stay true to its spirit in the Crysis games. But only Far Cry 3 really feels focused on doing that concept justice. You've got a huge island to explore, ridiculously effective tools for scouting every hostile situation, and so many clever intersecting systems to inspire creative ways to conquer them. It's a better stealth game than Far Cry 1, set in an open world that feels richer than Far Cry 2's. That's an amazing thing to play. Ultimately, Far Cry 3 left me a little conflicted. It's a smartly designed open-world game with a ton of stuff to do, and the random acts of hilarity that occur out in the jungle will constantly leave you with unique stories you'll be desperate to tell your friends. If the story had made good on the strength of its initial premise, Far Cry 3 would have been shoo-in for best game of the year. As it stands, it's still the most fun I've had in an open world in ages, a game that plays so well and looks so good, I wish every other piece of it reached the same high bar. It’s easy to see why someone would want to visit Rook Island – it’s a stunning tropical location with plenty of fun activities, scenic views, and history worth discovering. 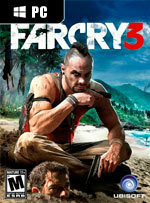 Far Cry 3 disrupts that paradise to challenge your feelings about enjoying violence. Because of lunatics like Hoyt and Vaas, you’ll see beautiful things you never would have. You’ll do terrible things that make you uncomfortable and meet fascinating, disgusting people. You’ll sympathize with Jason Brody’s difficult choices as he turns from vapid young man into a monster. 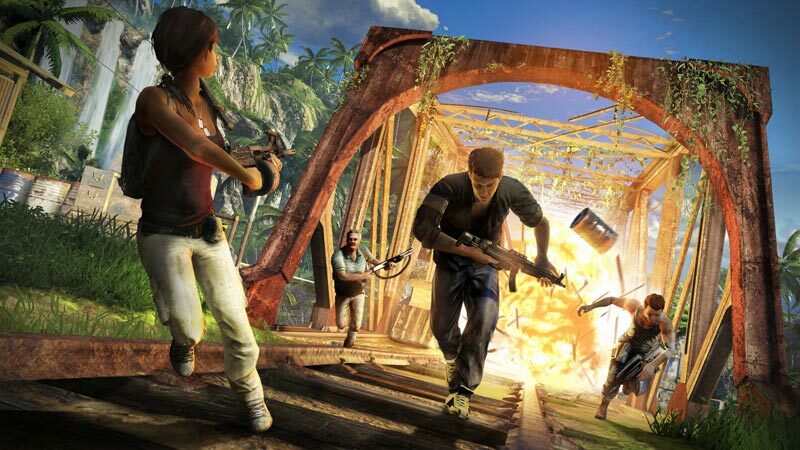 There are miles of terrain to discover in Far Cry 3, filled with numerous trials and objectives to explore at your own pace, and an excellent sense of connection with the game’s unhinged cast. 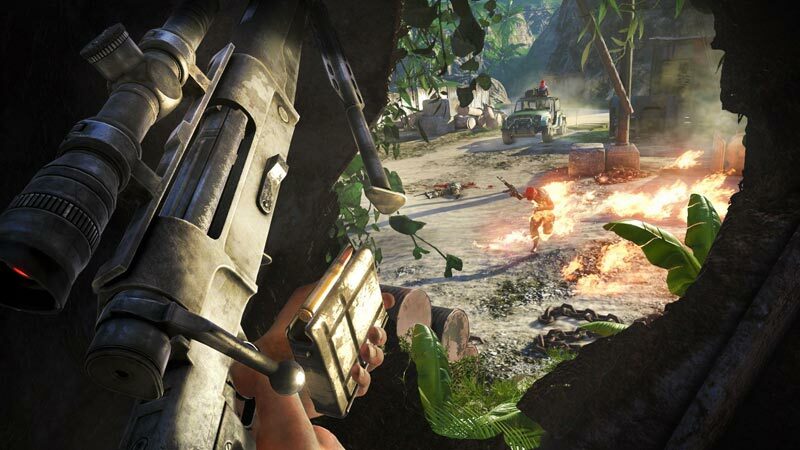 The co-op and competitive multiplayer components stand as comparative low points, but chances are you’ll be so busy trekking through this vast island that you’ll likely write them off as just another symptom of jungle sickness. One of those rare games where I feel no mode has been damaged by the inclusion of any others, Far Cry 3 is a well-rounded package that provides a mass of content clearly produced by developers who cared deeply about what they were doing. Far Cry 3 is going to be the last major mainstream release of 2012, and after quite a spotty year, I can at least say this industrious triad of amusements ends the past 12 months on a high note. Whilst we can't yet comment on how Far Cry 3's multiplayer shapes up, or see how the multiplayer will fare in the face of well established competition over time, we can tell you that everything else stands up to inspection. There's an unbelievable amount of content here, with a campaign that'll take well over twenty hours to complete, and a plethora of side quests to conquer and collectables to hunt down. Ubisoft has delivered a delicious tropical sandbox of epic proportions, and you'd be insane to let this one pass you by. Suffice to say Far Cry 3 is definitely the game its predecessor should’ve been, a constantly enjoyable open-world FPS that cleverly weaves in “optional” objectives with a compelling main narrative. Huge open area battles make way for smaller linear missions that are no less fun, with stealth and shooting equally strong. Despite a few technical quirks (seriously Ubisoft, patch the save system), a slight shortage of non-cutscene NPC interactions and the occasional lack of constant threat Far Cry 3 is a triumph that stands out from every other shooter released this year. Far Cry 3 is a haunting experience, in a very good way. It’s a damn shame the main campaign didn’t live up to the potential of what was teased and the sporadic appearance of sloppy anti-Far Cry linear levels jarred with what the game achieves when at its emergent best. Faults aside, Far Cry 3 is an open-world shooter that’s not to be missed, and a dish that’s beautifully served on PC. La serie Far Cry vuelve a cautivarnos con otro gran shooter, y es que Ubisoft nos brinda un paraíso convertido en infierno realmente memorable. Tiene sus pequeños fallos, entre ellos una IA discreta, pero hay tantas cosas buenas que cuesta mucho no hablar de un producto plenamente recomendable. Montones de cosas que hacer, contenidos abundantes y de muy diferente corte, y diversión máxima con enorme libertad y personalidad para uno de los grandes lanzamientos de este año. Und was für ein Spiel es ist. Zwischen Skills, angenehm beweglicher KI und dem Chaosfaktor der Natur, die im Wechsel mal euch, mal euren Feinden blutigen Rotz in die Suppe spuckt, entbrennen hier einige der dynamischsten Schlachten seit langer, langer Zeit. Mit seinem eingängigen Stealth-Modell, das selbst in der Third-Person nicht besser funktionieren könnte, und griffiger, faszinierend gut aussehender Action vereint Far Cry 3 obendrein mehr Spielertypen hinter sich, als es einem Dishonored auf der einen und einem F.E.A.R. auf der anderen Seite jemals möglich wäre. Far Cry 3 verspricht hingegen einen intensiven Thriller, den es spielerisch ad absurdum führt. Zum puren Selbstzweck hat Ubisoft die Inselwelt mit allem überladen, was spielerisch möglich ist: Sammeln, Schießen, Fahren, Onlineherausforderungen – Far Cry 3 ist das rücksichtslose Durchregieren sämtlicher Stichpunkte, die die Marktforschung den Entwicklern vorbetet. Hauptsache, der Spieler kann überall jederzeit alles tun, was ihm in den Sinn kommen könnte. Et les affrontements multi sont suffisamment solides pour qu'on y perde quelques précieuses heures de notre vie. En dehors de quelques points de détails assez facilement pardonnables, la nouvelle production d'Ubisoft réussit quasiment un sans-faute. Elle rejoint même le rang des titres réellement marquants, qu'on a envie de faire découvrir aux autres et dans lesquels on sait qu'on se replongera régulièrement. Il gioco in sé è realizzato benissimo ma non ottimizza l'enorme isola-contenitore, che non offre gli stimoli sufficienti a completare tutte le ricerche e le missioni facoltative. È un peccato, perché se già così Far Cry 3 è un titolo eccezionale, con un'ulteriore cura nelle meccaniche avrebbe potuto diventare un capolavoro assoluto di ineguagliata longevità, sebbene il suo ciclo di vita resti comunque superiore a quello di altri FPS. I det stora hela är Far Cry 3 ett aningen ojämnt men också väldigt underhållande actionspel. Ubisoft försöker fortfarande hitta spelseriens identitet, vilket gör det intressant och roligt att ta del av även om det ibland trampar i klaveret. Inte helt olikt paradisöarna det utspelar sig på så påminner Far Cry 3 om en veckas chartersemester i solen. Trevligt, avslappnande, kanske en smula förglömligt men också konstant kul från start till mål.